This post is not lamenting in nature. 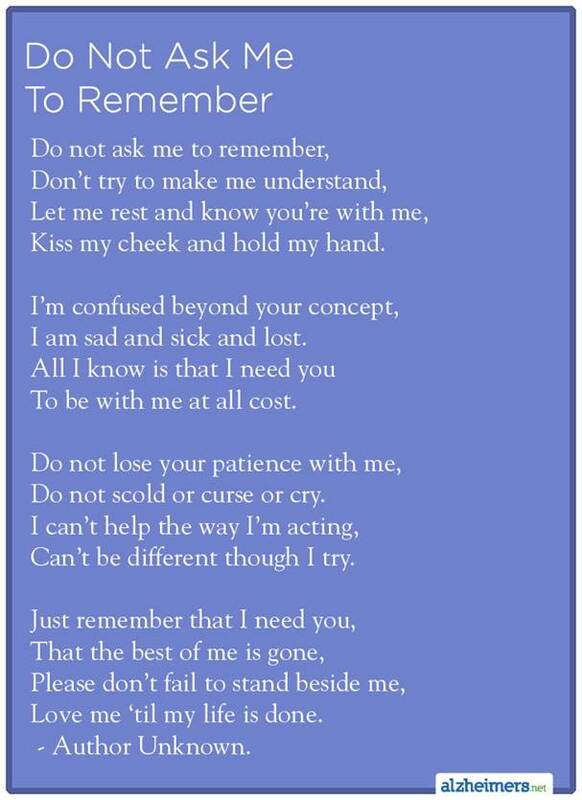 What I mean by that is that it is not: Why, oh, why, did my LO get Alzheimer’s? Disease is part of this fallen world. We do our best to avoid contracting them by healthy living but the truth is, humans succumb to disease regardless. Age, money, family, religious beliefs, good, bad, ugly, pretty, fame, fortune. None of these are barriers to disease. The why of this post is rather, why throw money at a disease that generally affects people later in life? They’re going to die in a few years anyway. You’ve thought this. Others have thought this. I’ve thought this. It’s the snake hiding under the carpet sneering at us: They’re not important anymore. They’ve lived their life. Leave them to the vultures. For me, however, working in a nursing home when I was seventeen woke me up to a new appreciation for the aging and aged. I never knew that learning to change adult diapers as a teen would be a catalyst to learning compassion. Or that sitting at the edge of a wheelchair, trying to understand an eighty-year-old woman stroke victim would be a lesson in perseverance. Or that transferring a cranky old woman with a gutter mouth would teach me empathy. We don’t know what the future holds for us personally. You may develop Alzheimer’s one day, or suffer a stroke and be desperately trying to communicate something but your mouth won’t form the words. Would you want to be attended by someone who throws up their hands in disgust, rolls their eyes, and abandons you? Or would you rather want to be attended by someone who sits patiently and struggles alongside you? Education. Awareness. Research. Attention. Understanding. This is the Why of this post. Why fund the research for a cure of this disease that generally strikes old people? Because age and disease do not negate an individual’s humanness. Because aging and disease teach us compassion and respect. Because aging and disease give us an opportunity to honor those who’ve lived through wars, poverty,pain, births, deaths, tragedies, and triumphs. Because aging and disease teach us the perseverance we will need if (when) we age and succumb. Because Early Onset Dementia (EOD) is a public health problem. Mayo Clinic states, “Of all the people who have Alzheimer’s disease, about 5 percent develop symptoms before age 65. 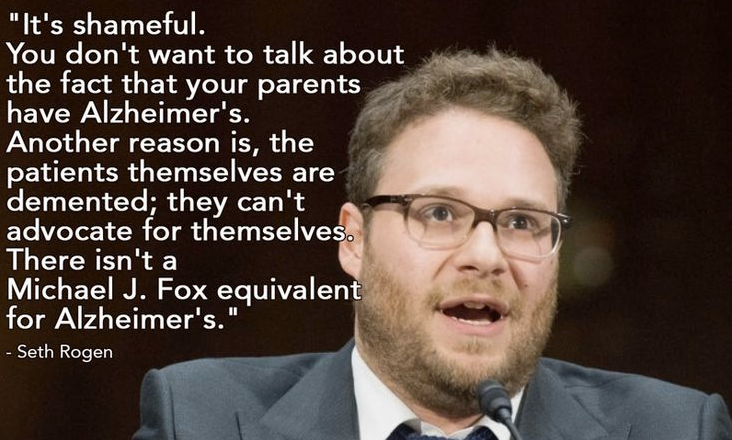 So if 4 million Americans have Alzheimer’s, at least 200,000 people have the early-onset form of the disease. This could be YOU some day. Because those who cannot speak do not have a voice. Beautiful post, Janice. Yes, we can learn so much by caring for those who are sick and for our elders. 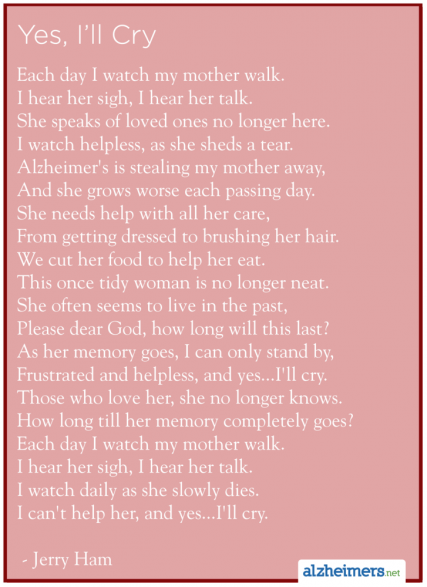 It was an honor for me to care for my mother with Alzheimer’s, to be her voice and in the end to love her with the same special sweetness as I loved my children when they were small and helpless. The elders are us as we will be in the future, and we hope someone will love us then, too. Thank you, Linda. I’m sure your mother felt your presence and caring heart. Bless you.